Louisville is known as the Possibility City, and that name certainly captures the spirit of the people residing in our great town! Of course, Kentuckians historically have a tendency to see things a little differently; while some may have seen grain that went bad during shipping as a liability, inventive Kentuckians saw it and thought, "We should do something about that!" They came up with a method for processing the grain for easier shipping, and voila - bourbon was born! Although he wasn't born in Louisville, there's a kindred spirit to be found in Louisville Magazine's 2009 Person of the Year, Gill Holland. Gill Holland has both an eye and goals for the future. He recently posed two questions to business students at the University of Louisville: "What are you doing to make this city better?" and, "How do we make Louisville the coolest place in America?" While these may seem like lofty goals to some, Gill Holland has conviction. Seeking city transformation, he has asked himself these same questions, and is sharing his vision on how to get it done. Holland knows that Louisville has what it takes to become the next American "hotspot." He refers to the Confucian ideal that "a city with great culture attracts power and wealth." One way to do that, is to become a "City of Arts and Parks." Holland says, "There's a reason Seattle has companies like Microsoft. The 20-something, creative hipster wants to go to a city that has clean air, and nice parks. We have tons of nice parks. We don't have clean air, and that's a problem." Some studies have shown Louisville with the fifth largest carbon footprint in the nation. No worries - Gill has a plan! 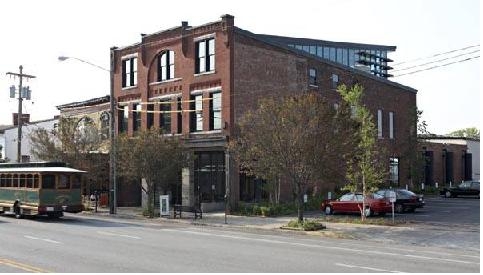 The East Market district of Louisville has been transformed under Holland's "green" thumb. NuLu is a great example of the direction in which Gill Holland would like to see Louisville go. In a nutshell, the idea is to bring art and culture to the neighbor-hood, while firmly embracing the art of sustainability. The centerpiece of NuLu is the Green Building. Recycled wood adorns the ceiling, natural light floods the space, and a "green wall" of sedums and ferns grace the downstairs. The building is 72% off the local power grid, and Holland looks to the day when buildings like this are 100% off the grid. With true Louisville spirit, he is showing that it can be done. So what is the long term outlook for a greener Louisville? One of the key ingredients is public transportation. A light rail transit system connecting Louisville, Fort Knox and Frankfort KY is part of Holland's vision for the area. Add an upgraded TARC system, a tax-free zone downtown for new businesses, local farmers providing foods for schools and correction facilities, and tackling unemployment by becoming a top manufacturer of green energy solutions like wind turbines and solar panels, and we have the perfect recipe for a thriving, sustainable city. While all this may seem impossible, remember that we're talking about Louisville, where ingenuity is almost genetic! If this sounds like the kind of city you want to to call home, call Jessica Gaines of Louisville Gaines Real Estate. And plan to stop by the second annual NuLu Festival on Saturday, October 2. Listen up, Louisville! Call Jessica.